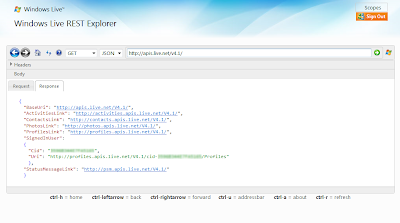 This post is part of a series of related posts on how to use Windows Live Messenger Connect. 1. 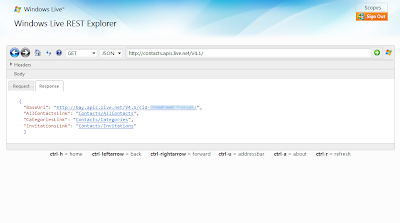 (this post) Using Messenger Connect REST Explorer for exploring Windows Live resources. 3. Getting contacts in three different ways (API and REST). 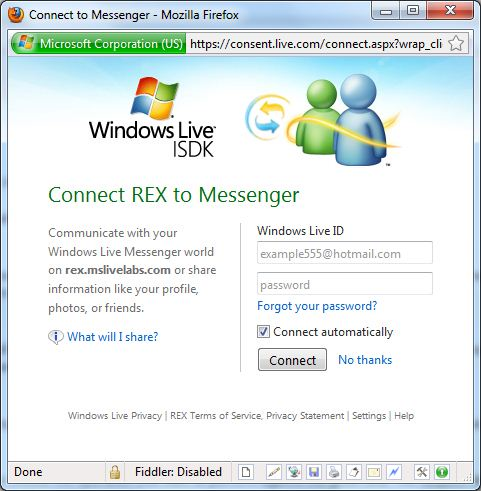 Messenger Connect is a new offering from Microsoft that allows you (a developer of a web site) to allow your customers to log into your web site using Windows Live credentials. Your Messenger Connect -enabled web site furthermore, allows users, once they have authenticated and consented, to be able to access their social graph (contacts, activities, etc.) while on your site. For more information see this Windows Live post. It is similar to FaceBook Connect which was discussed previously in this blog here and here. However, Messenger Connect comes to the table with a more mature set of APIs (Windows Live SDK - download here) and more flexibility for different scenarios. In this post we'll deal with the first step in understanding Messenger Connect and that is understanding the data model (technically called the Resource Model) that supports these capabilities. We'll do this using a tool that Windows Live has provided called Windows Live REST Explorer (REX): http://rex.mslivelabs.com/. We will view data from and write data to the Windows Live cloud. 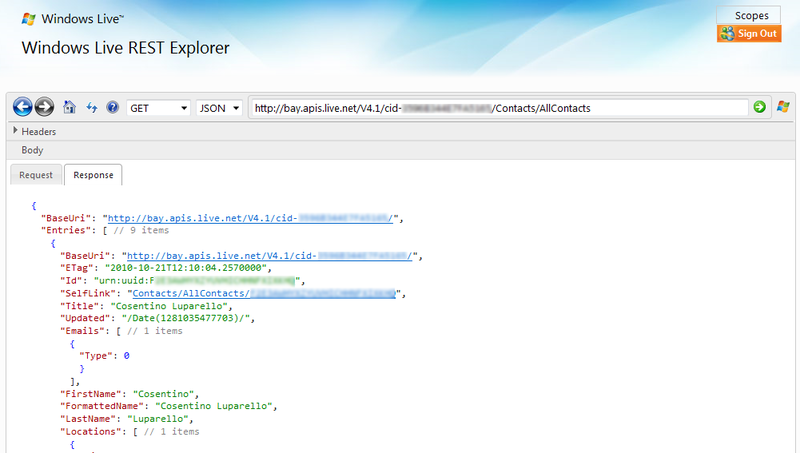 The Windows Live Resource Model is similar to the Facebook API, but whereas the Facebook API had some public data you could access without having an Application ID (i.e. registering with Facebook). 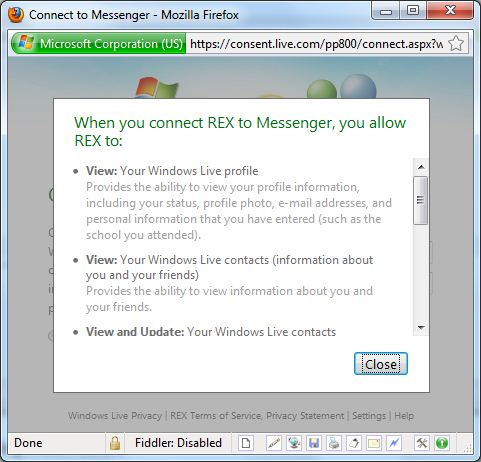 Instead, viewing Windows Live resources using REX requires you to log in to begin seeing any data. Furthermore, with REX you are exploring your own data, not the data of others. 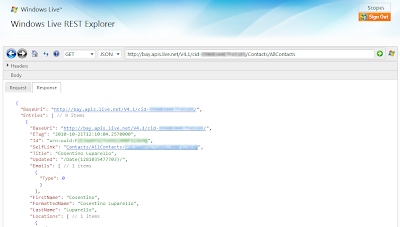 The Windows Live Resource Model defines top level resources such as contacts, profiles, and activities, collections of data entries, and data entries (an individual contact or profile, e.g.). It's not completely intuitive at first glance, but suffice it to say you can get to all of your Windows Live data one way or another. Each top level resource, collection, and entity has a unique URI address. 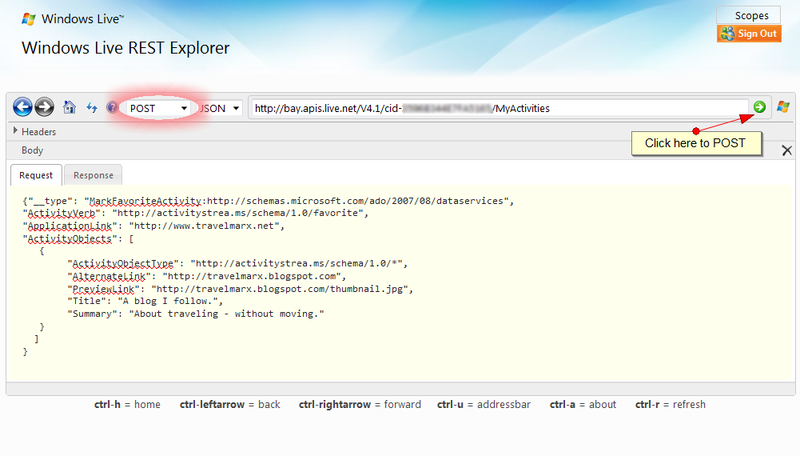 The Windows Live Resource Model is RESTful in that you make requests (via the browser client) and receive responses. Each request is for a specific (REST) resource that is uniquely addressed. So, every piece of your Windows Live data is accessible with a well formed URI and can be accessed provided you have been authenticated. Let's look closely at REX. The first thing you have to do is choose a Scope and then log in. The idea of a scope is that it indicates what resources you want to access and what you want to do with them (view, update, e.g.). Let's make sure the scope matches the screenshot below. 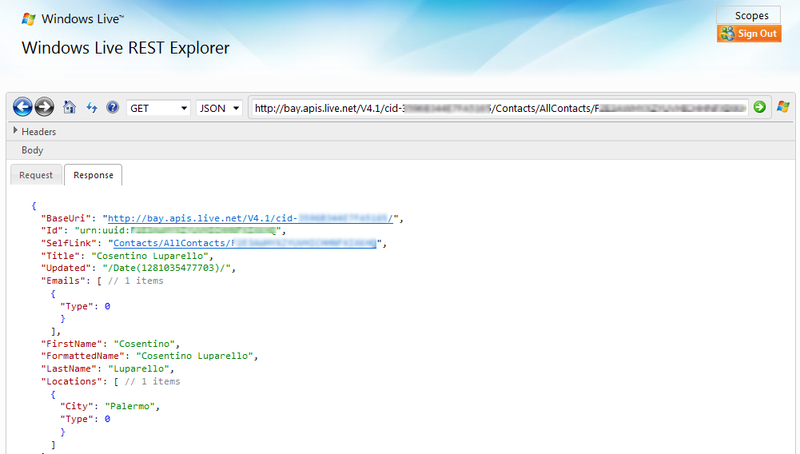 In particular we want to select the ability to update contacts (WL_Activities.Update). 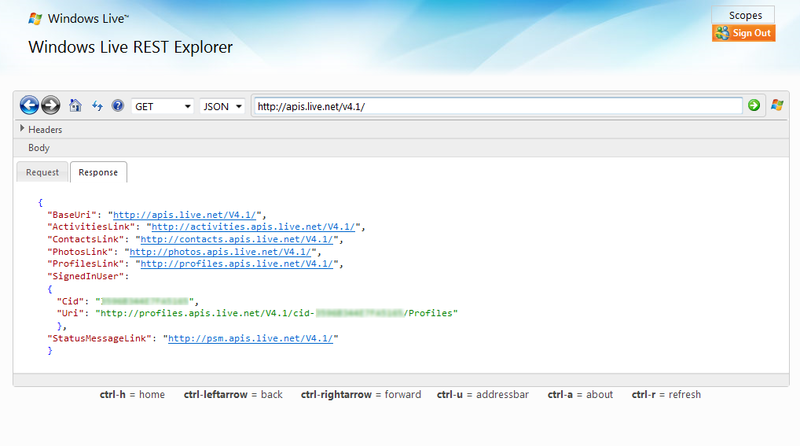 WL = Windows Live. Activities = resource. Update = permission desired. After setting the scopes click the Connect button and you should receive the consent dialog shown below. If you click the "What will I share?" link you can review what is going to be shared. It will match the scopes you specified. The real interesting scenario for reviewing what you will share is for a web site that is Messenger Connect-enabled and you, now playing the part of the user, do not know what scopes have been specified and you want to review them before consenting. It’s your chance to refuse sharing your data. But in this scenario here, you are just viewing your own data so you should be okay to consent. After successfully authenticating and providing consent you are at the top level of your resource tree. REX allows you to see resource data in a variety of formats (RSS, ATOM, JSON, or POX). 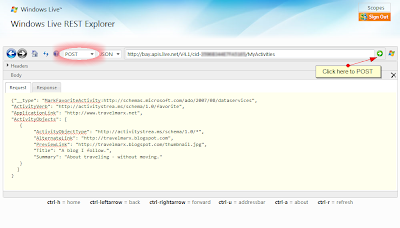 Change it a few times to see the different formats, but for this post we’ll stick with JSON. In all the screenshots in this post the CID is obscured. When you log in your CID will be unique to your Windows Live credentials. From the REX home page you'll be able to drill down through data going from top level resources to resource collections to data entities. So, for example, if you click through the ContactsLink on the home page you come to the collection page of categories and contacts. 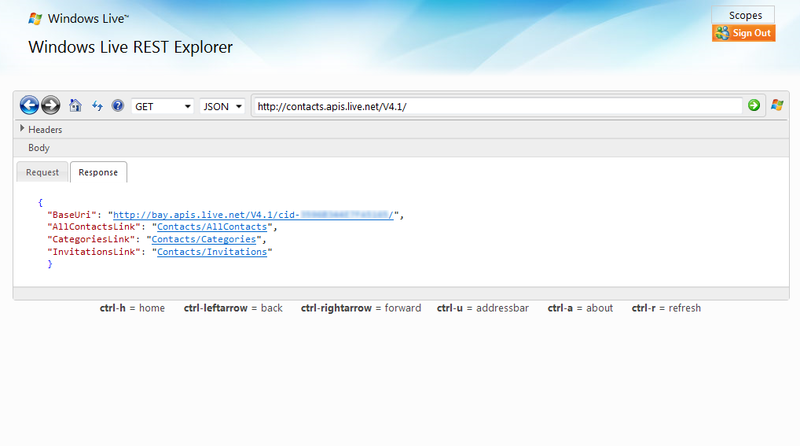 Clicking the AllContactsLink, you come to the contacts collection page. Clicking through to any of the SelfLinks of a contact brings you to a contact entity page. You've drilled all the way down to a resource, a contact in this case. 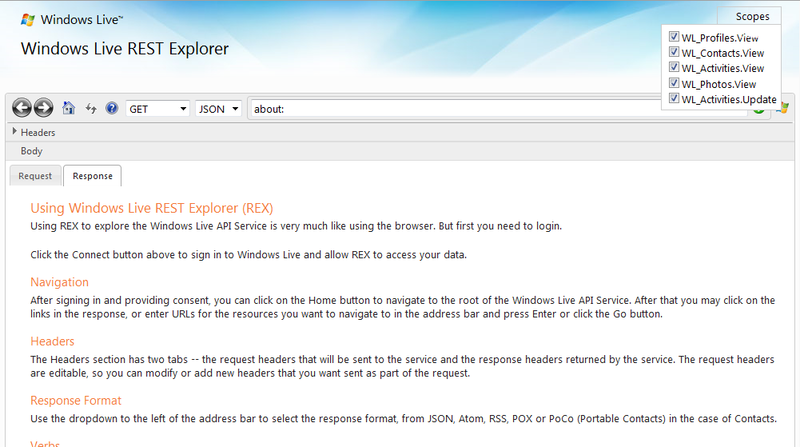 Don't forget that if you log into http://home.live.com/ with the same credentials you used for REX you will access the same data, but through the UI. Also, if you captured the URL http://sn1.apis.live.net/V4.1/cid-**YOUR-CID-HERE**/Contacts/AllContacts, closed the browser, reopened and pasted it in the address bar you will receive either nothing or an error The idea is that you can’t access a collection or entity without first authenticating. "Summary": "About traveling - without moving." 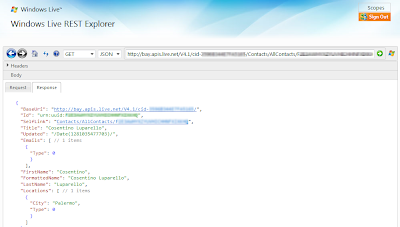 Note that we have kept the default data presentation of JSON and so we'll enter data in this way as well. For more information on the syntax see http://json.org/. Click the submit button (the green arrow) and the activity should be created and appear in your Messenger Social feed as shown above. 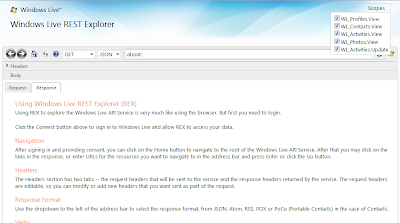 So, there you have it, a quick overview of the Windows Live REST Explorer (REX) that allows you to browse Windows Live resource data. The book Amazing Rare Things: The Art of Natural History in the Age of Discovery (2009) is the guide for an exhibition of the same name that took place at the Queen’s Gallery, Buckingham Palace, London March 14 – September 28, 2008. If only I were there! Most of the imagery in the book appears on the related exhibition site. Natural history is the study of plants and animals through observation rather than experimentation. Amazing Rare Things gives you a whistle-stop tour of the development of natural history by focusing on five individuals from the 15th to the 18th century. A short chapter is devoted to each featured individual: Leonardo da Vinci (1452 – 1519), Cassiano dal Pozzo (1588 – 1657), Alexander Marshal (c. 1620 – 1682), Maria Sibylla Merian (1647 – 1717), and Mark Catesby (1682 – 1749). 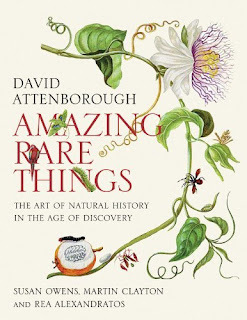 David Attenbourough contributes with an introduction to the book as well as comments on illustrations interpersed throughout the volume where he gives insight into what the illustrator must a have been thinking or observed. To be honest, this guide/book is probably not the best source to get a good introduction to natural history, but is really designed for those already familiar with this subject or those really into botanical art. This book is all about beautiful imagery, drawings and watercolors, by Leonardo, Marshal, Sibylla Merian, and Catesby, as well as images from the “paper musuem” of the collector dal Pozzo. A reocurring theme throughout the book is that of the cabinet of curiosities which was a collection of objects whose categories and relationships were not well defined. Do we have curiosity cabinets today? I think so, just in a different way. 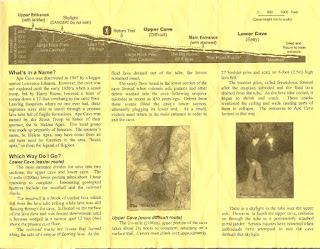 I like to think of this blog or my copious personal notes (as disorganized and scattered as they are) as a humble form of a digital cabinet of curiosities – applicable to me. Anyway, I digress. Cabinets of curiosities were an important step in the evolution of natural history. As key collections came together, drawing objects in the collection followed, and that was then followed by the search for new curiosities to expand the collection to satisfy the collector’s ego, impress his friends, or maybe just for curiosity’s sake. Curiosity cabinets grew from the introduction of new flora and fauna into Europe from a new age of exploration. The influx was exponential and challenged long held beliefs and classification systems. Reading Amazing Rare Things I was introduced for the first time to the incredible story of Maria Sibylla Merian. In 1699, age 52, and divorced she journeyed from the Netherlands to Surinam (South America) to study first hand the country’s flora and fauna, and in particular, butterflies and moths. She remained there for several years there and returned to produce her monumental Metamorphsis insectorum Surinamensium published in 1705. Travelmarx has gone buggy, or, shall we say beetle-y, lately. Here’s a beetle, the desert blister beetle (Lytta magister), that we saw a few months ago while hiking on the Eisenhower Mountain Trail (accessible from the Living Desert) in Palm Desert. We saw swarms of blister beetles eating brittlebush (Encelia farinosa) like the one pictured here is doing. The term “blister” in the common name for the blister beetle comes from the fact that these beetles can emit a poisonous chemical, cantharidin, through what is called reflex bleeding (autohaemorrhaging). As a side note, there is such a thing as a Spanish fly (Lytta vesicatoria) - in the same genus as the blister beetle – which can be used to incite mating in farm animals. Ingested cantharides (from the crushed powder of this beetle) pass through the digestive track and cause irritation in the urethral passage. That doesn’t sound like fun. The photo above is a ladybug or ladybird in its larval stage which usually goes for about two weeks. This beetle is probably toward the end of the larval stage judging by the color on its back. After the larval stage it pupates and becomes an adult. Since ladybugs/ladybirds are neither a bug nor a bird the preferred name is lady beetle. Lady beetles belong to the family Coccinellidae which is part of the beetle order, Coleoptera (from the Greek koleos “sheath” and pteron “wing” = sheathed wing). We will hazard a guess that this is Harmonia axyridis (Asian lady beetle), the most common lady beetle in North America. It was introduced into North America several times, most recently in the 1980s by the USDA, to control aphids. It is not known whether the axyridis population in North America is from the intentional introduction or accidental introduction or both. This zebra spider (Salticus scenicus) was helping clean around the house the other day and we snapped this photo. Zebra spiders are a type of jumping spider. They do not build a web, but rather move around looking for prey. We were glad to read that jumping spiders are noted for their awareness when being watched by humans and often turn their body toward the observer. We were starting to get a little wigged out there. More on jumping spiders. The genus name we are guessing derives from the Latin verb root “to jump”. In Italian, the verb for jump is saltare. 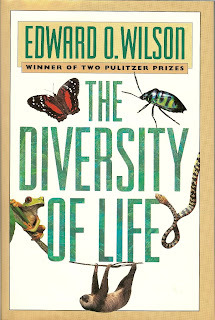 The Diversity of Life (1992) is a book by the eminent American biologist and author E. O. Wilson. 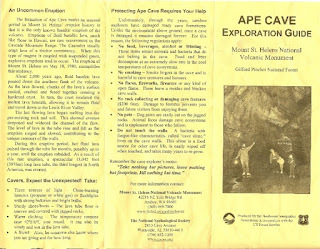 If you are not into rolling up your sleeves and getting into science details or you don’t believe the earth is about 4.5 billion years old and all that goes with that, then this book is not for you. The Diversity of Life is a fascinating read that will introduce you to biodiversity, how it’s measured, and how it has changed over earth’s history. The biodiversity of the world in its simplest definition is the number of distinct biological species. 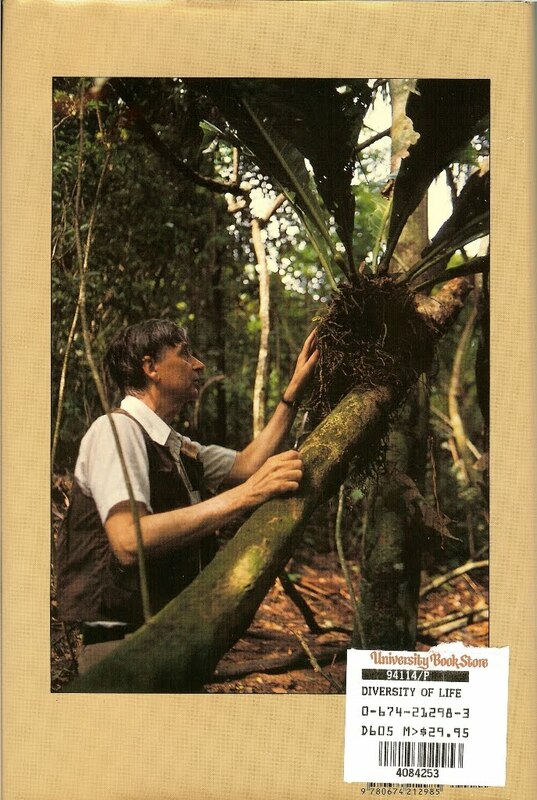 Wilson, when he wrote the book, cited about 1.4 millions species described. Today it is higher, at about 1.8 million species as given at the Encyclopedia of Life. As discussed in The Diversity of Life, the actual number of species is likely much larger by as much as a factor of ten. The current biodiversity of our planet is at its highest level ever, but is being diminished significantly by human activity. This conclusion is arrived at based on estimates of how long species lived and went extinct before humans arrived and comparing that with an estimate how many are going extinct today. For example, Wilson writes that, on average, a species lived on the order of one million years in the absence of human interference and that “human activity has increased extinction between 1,000 and 10,000 times over this level in the rain forest by reduction in area alone.” But lest you go away thinking this is another book about how bad humans are the book really doesn’t leave that impression. 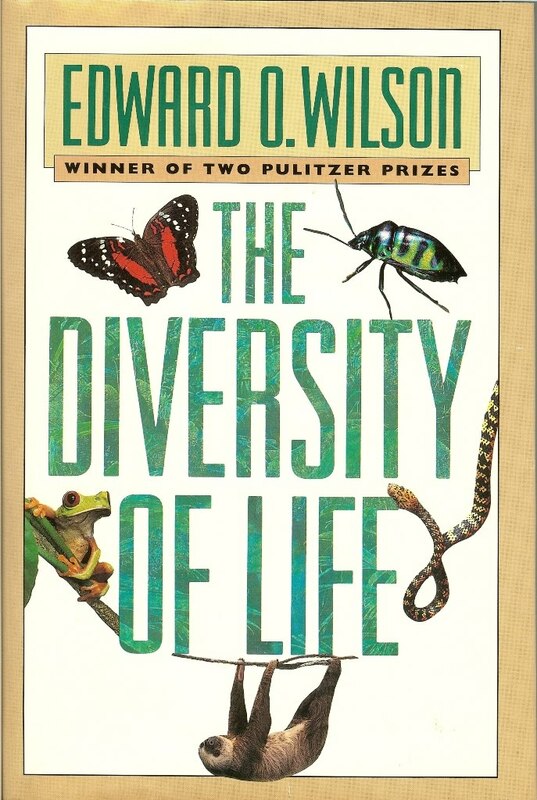 Rather, Wilson acknowledges how and why humans are impacting diversity and ends the book by offering five suggestions for preserving as much of earth’s diversity as possible. 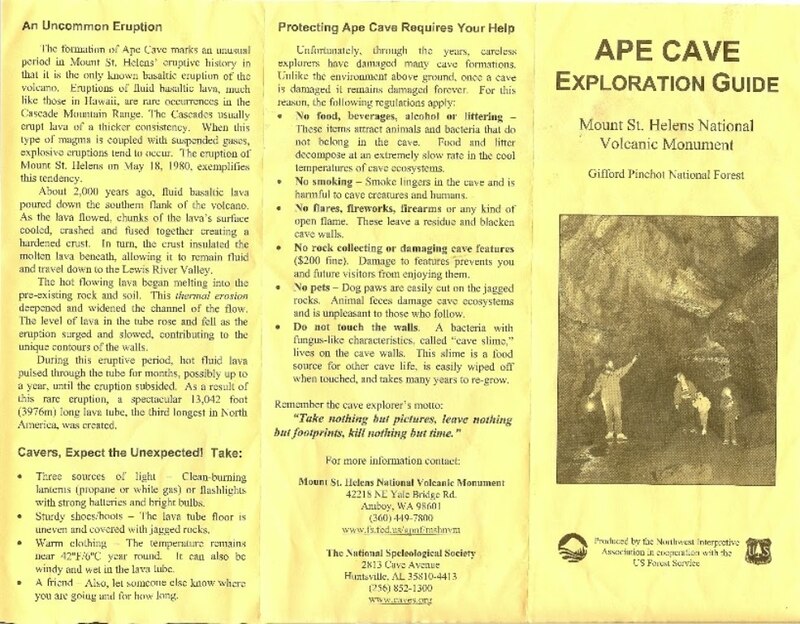 Without being a plot spoiler the biggest “how” is destruction of habit - see for example the IUCN Red List. The reasons “why” are more numerous and include farmers clearing rainforest to survive and feed families and general unfamiliarity with what species are at stake (the “unknown unknowns” to quote Rumsfeld), to name just two. Why do the tropics dominate in biodiversity? Because there is more solar energy available, the climate is more constant, and there are large areas available for life. These three factors are described by Wilson as the Energy-Stability-Area (ESA) Theory of Biodiversity. How many extinction events were there? There were five great extinctions when diversity plummeted dramatically including the Ordovician (440 million years ago), Devonian (365 mya), Permian (245 mya), Triassic (210 mya) and Cretaceous (66 mya) extinctions. The last extinction took out the dinosaurs. Why is biodiversity so high now? According to Wilson, it is due to widely separated continents with long shorelines and stretches of shallow tropical waters with islands. It wasn’t always like that. What is the smallest number of breeding individuals of a species that are considered healthy for that species? Risk of extinction of a species is given approximately by the 50/500 rule. 50 healthy adults are the minimum needed to avoid inbreeding, and 500 for long term viability. Species that have evolved to specialized environments are in general more vulnerable to extinction than less specialized species. The richest nations (mostly northern) preside over the smallest and least interesting biota and conversely, the poorest nations preside over the largest and most diverse biota. Human diets are narrow by choice, not by natural mandate. Our reliance on a fixed number of plants and animals has negative diversity consequences because land cleared to grow these plants and animals can often be utilized more efficiently growing different, often locally tailored choices. Exemptionalism is the belief that humans are a new order of life and are exempt from environmental forces. Wilson urges that we be on guard and that we do not fall prey to exemptionalism by letting species perish and biodiversity decline. One aspect of the book that is especially nice is the use of ample diagrams, illustrations, and photos interspersed throughout. These, taken with Wilson’s writing style make this an accessible book for a wide range of readers. One hint for reading The Diversity of Life is to check the Notes section for each chapter while reading the chapter. There is valuable information contained in the notes that will help you understand how Wilson reached his conclusions.